- McDonald's has Adventure Time and Paul Frank toys in their Happy Meals. These were delayed a bit, but started showing up around January 17th, so go get them! 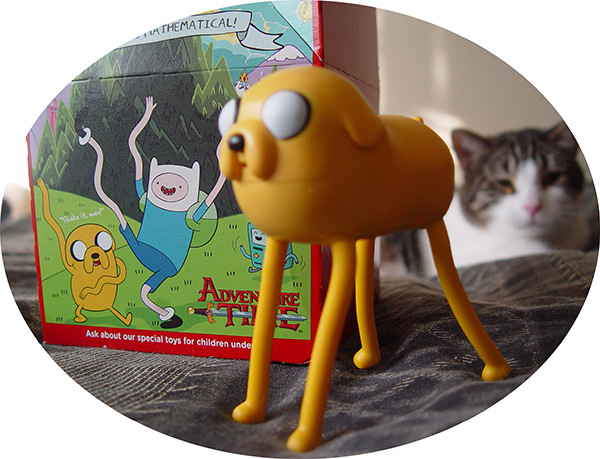 There are only six different Adventure Time toys, which limits the character choices. The next promotion shown appears to be cups based on The LEGO Movie. It's fascinating to see them get a LEGO license and then the toy is not an actual LEGO set. In the past, they have done LEGO sets as well as toys inspired by LEGO items. - Burger King has Pac-Man and the Ghostly Adventures toys in their Kids Meals, with Ice Age toys coming soon.